Below are Box Office Collection Report of bollywood film Hindi Medium With his review, budget and total box office and worldwide collection status. 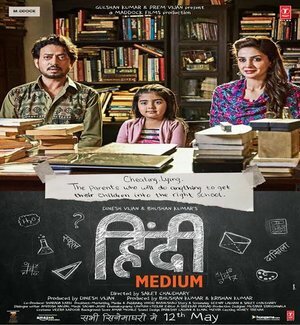 Hindi Medium movie lead star cast is Irrfan Khan, Saba Qamar. Hindi Medium is an indian Drama Film of 2017, directed by Saket Chaudhary & produced by Bhushan Kumar, Krishan Kumar, T-Series, Maddock Films Presents. The film collected a little over Rs. 3.3 crore on Tuesday. The total box office collection now stands at Rs. 19.1 crores. Irrfan stars opposite Pakistani actress Saba Qamar in Hindi Medium. The movie is based on the commercialization of Indian education system, which basically gives importance to English language. Hindi Medium is made on budget of Rs. 23 crores. At first glance, this film is about growing craze in English medium schools, like cooker makutta, which has become a challenge for other Indian languages including Hindi and breaking the backbone of government schools. As Irrfan Khan has a dialogue in the film, "English is no longer a language in India but it has created a class." (3) This isn't really a movie. This is an experience to be shared, a story to be shared with future generations. Irrfan at his best ever.